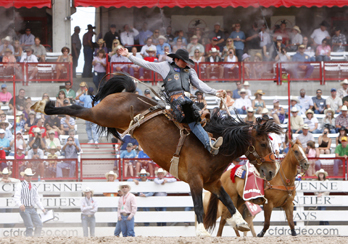 Saddle Bronc rider Sam Spreadborough earned 77 points aboard Miss Liberty on his way to earning third place overall. If a fan of the west starts thinking the cowboy lifestyle is on the decline, all they have to do is visit Cheyenne Frontier Days and realize it’s alive and kicking. From its huge world-class rodeo to all the western trappings a visitor could ever want, the 114th annual event was an Old West lover’s dream come true. With estimated tallies ranging from 300,000-500,000 visitors coming to see all the happenings in the park and throughout the city of Cheyenne during the 10-day timeframe, the “Cowboy State” made a serious effort to provide them all a glimpse of the west they wouldn’t forget. Not counting all the efforts in the city of Cheyenne to entertain visitors, Frontier Park itself boasted the largest outdoor rodeo in the world, Native American culture in its Indian Village, a carnival midway, Old West Museum and shopping in its Wild Horse Gulch among re-enactors of old west history – a slice of Frontier Days becoming more popular since its inception ten years ago. 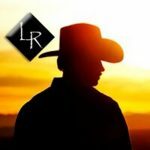 One thing the Wyoming venue knows the crowd will feel a part of every year is their world famous outdoor rodeo structure, which sold nearly 200,000 tickets for rodeos and concerts and garnered positive vibes from contestants all the way up to PRCA officials. Those working on the inside agreed with Bainbridge in a big way. Rodeo cowboys felt much the same way. Asked about earning a top score in the final round before thousands of home state fans, Timberman’s enthusiasm persisted. What that means is … Cheyenne keeps the west alive and kicking.